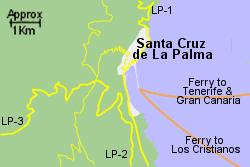 Map of the Santa Cruz de La Palma Port area. 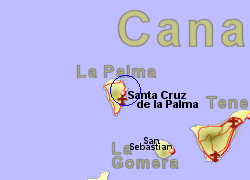 The port at Santa Cruz de La Palma is located on the edge of this small capital city, on the eastern coast of the island. Roads on the island can be narrow and winding but generally well mintained. 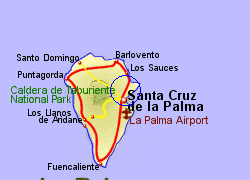 The road crossing the island from Santa Cruz to Puerto, is 38Km and will take nearly an hour by car, yet it is only 17Km as the crow flies. 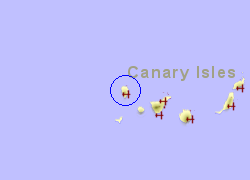 There are regular bus services around the island. Operated by Acciona with 1 crossing per week, crossing time 5 hrs 30 Mins. Operated by Acciona with 1 crossing per week, crossing time 19 hrs. Operated by Fred.Olsen Express, 8 crossings per week, crossing time 3 hrs. Also operated by Armas with 6 crossings per week and crossing time 4hrs..